50 people died in the riots that Demirtas called his party to support - including 4 children conducting charity work in Diyarbakir. Now, the ECHR is requesting for his release. Demirtas’s parliamentary immunity was lifted based on the general vote in Turkey’s National Assembly with regard to the lifting of parliamentary immunities on May 20, 2016. Demirtas had already been sentenced for carrying out terrorist propaganda in 2013 and again was detained on 4 November 2016 with new charges and was finally sentenced last September. Nevertheless, he is also facing much heavier charges for his alleged role in the PKK-backed violent riots on October 6-7, 2014. On top of a number of speeches given by Demirtas, he also called his party to join the riots. 50 people lost their lives in the riots including 43 civilians, 2 police officers, and 5 PKK members. The most dramatic scene of the events was the death of four friends in Diyarbakir on October 7, 2014. They were part of a humanitarian organization and were conducting charity work, when they were spotted by the PKK-backed rioters. Among the friends, 16-year-old Yasin Boru’s death was the most brutal one. After three of his friends were shot dead (one could run away despite his injuries), Boru was beaten, stabbed, thrown from the roof, and then burnt to death. 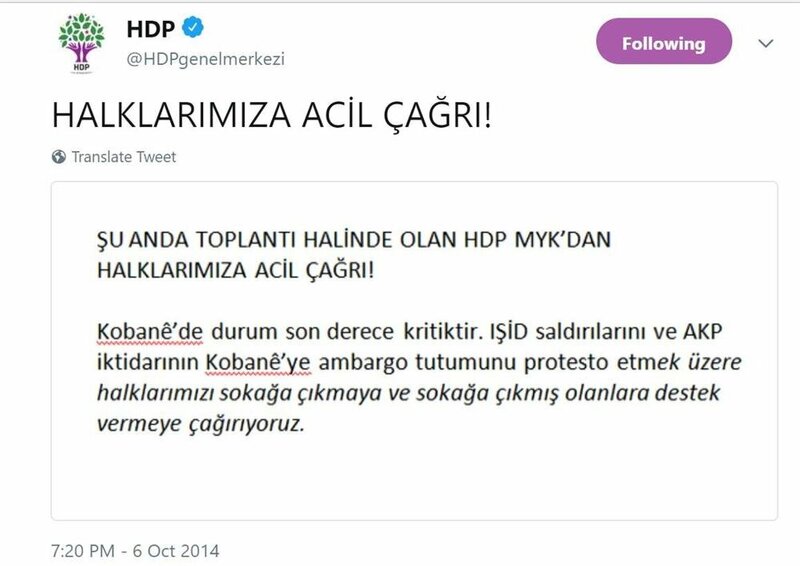 And all this time, the HDP and its co-leader Demirtas were accusing Turkey for using Daesh as “hitmen” and calling people to join the “resistance.” (Resistance is almost a code for HDP elites in glorifying the PKK’s armed campaign. This was also the keyword when HDP made calls for an urban warfare campaign in the summer of 2015). Demirtas later made a public statement in Diyarbakir three days after the murder of Boru and his three friends. In his speech he stated, “We made the call for people to join the protests (riot)” but argued that there was no violence, for which he actually did not use the word riot but “the glorious public resistance.” This speech in which Demirtas blamed the government for the use of violence also took its place within the indictment against Demirtas in his trial in Turkey. I’m not sure whether the ECHR paid attention to this and alike speeches in the indictments in Turkey, but the ECHR verdict also held that Demirtas “could be said to have been arrested and detained on “reasonable suspicion” of having committed a criminal offence and that there had therefore been no violation of Article 5 § 1 of the Convention.” Nevertheless, the Court ruled that Turkey had violated the right to be brought promptly before a judge, the limitation on restricting a person’s rights, and the right to free elections. After the decision came out on Tuesday, there was a harsh debate as to whether Turkey will release Demirtas or not. I’m not an expert in law, but here is the decision: The Court held that the respondent State was to ensure that Mr. Demirtaş’s pre-trial detention was ended at the earliest possible date, unless new grounds or evidence justifying his continued detention were put forward; and that Turkey was to pay the applicant 10,000 euros (EUR) in respect of non-pecuniary damage and EUR 15,000. In response to the voices raised within the EU in regards to the ECHR's ruling on Demirtas, Turkish Foreign Minister Mevlut Cavusoglu stated: "Why are you so silent when it comes to Greece's non-compliance?" The Court’s most concrete decision is about compensation, but I’m not sure about Turkey’s response with regards to the payment. After all, President Erdogan stated that the ruling is not binding. Further, Turkey’s Foreign Minister Mevlut Cavusoglu criticized the decision and the statements that the EU’s High Representative for Foreign Affairs and Security Policy and Vice-President of the EU Commission, Federica Mogherini, made on Turkey. In his response, Cavusoglu was on the same line with President Erdogan’s earlier comments and responded to Mogherini by saying, “Why are you so silent when it comes to Greece’s non-compliance?” In a nutshell therefore, it seems that there are no signs for the immediate release of Demirtas.